Despite Great Streets being a signature transportation project of Mayor Eric Garcetti, throughout the city the vision, outreach, and implementation are driven by the enthusiasm of the local City Council offices. Staff in the Mayor’s Office is working closely with each of the fifteen Councilmembers to create a Great Streets program that is locally-driven and Council-approved. While local support and local leadership is crucial to any movement that seeks to create major changes, sometimes the Council offices have proven more of a roadblock to change than a partner in creating great streets. On one hand, Councilmember Mitch Englander, one of the more conservative Councilmembers, has been a surprise, not only for backing the largest protected bike lane in Los Angeles, but for programming that activates Reseda Boulevard as a destination. On the other hand, you have Paul Koretz, considered by many to be a champion environmentalist, and Curren Price, who belatedly got on board with the MyFigueroa! street transformation, working behind the scenes to remove bike facilities from plans for Westwood Boulevard and Central Avenue, respectively. Nowhere were expectations higher for Great Streets than in the Westside’s CD11 where Councilmember Mike Bonin was the first Councilmember to be elected with a platform for Livable Streets reform. And that’s important, as the Great Streets team in the Mayor’s Office consists of two staffers and a handful of interns and fellows. That’s not per district, that’s for the entire city. The experience in West L.A. with Great Streets is pretty much the opposite of that along Central Avenue in South Los Angeles. There, most residents, business owners, and community advocates only saw plans for a dramatically altered Central Avenue when Sahra Sulaiman showed them printouts while researching a story for Streetsblog. The difference an engaged and enthusiastic Council Office can have is dramatic. After all of that outreach, Bonin’s office announced last week that a pilot program will be on the ground in the “winter/spring of 2016.” Some of the most popular proposed changes include more mid-block pedestrian crossings, opportunities for public gathering spaces (parklets, plazas, even sidewalk seating), improved bikeways, and more and better street furniture and trash bins. “Those are some dramatic, exciting improvements, and we’ll need to use some of the space usually reserved for automobile traffic to get it done,” Bonin’s office wrote in an email to participants that was also posted on his website. Building support for a Great Street is a lot like chess, right Mike? While the Council Office wasn’t specific regarding what the pilot would look like, it seems the thought is similar to the ongoing Broadway “dress rehearsal,” in that temporary changes will be made to the street to improve the bike facilities, calm the traffic, and add mural art and native plants to the streetscape. A graphic included on Bonin’s blog post shows a Venice Boulevard with protected bike facilities, bump-outs for pedestrian crossings and transit lanes, and plenty of space for outdoor seating. “All one has to do” is remove a car-travel lane in each direction. The temporary nature is so that the city can assess whether this is what the residents and community truly want. But so far, with the exception of the darkening of the bright green buffered bike lane in Downtown Los Angeles, the city has yet to turn its back on a progressive transportation project after the pilot is over. While the Great Streets and People St projects are both fairly new, the parklets scattered throughout Jose Huizar’s District in Downtown Los Angeles and the Eastside and the Sunset Triangle Plaza have both been improved in the years since they were installed. Sarah Auerswald has been heading up the nascent Chamber of Commerce. Both Auerswald and the Chamber have been vocal backers of Great Streets, but know it can be a hard sell when one is proposing to remove mixed-use travel lanes. “I’m excited to see a bold plan for Venice Blvd that includes protected bike lanes and some parklets, not to mention the mid-block crosswalks that will improve mobility and safety,” Auserwald writes. The Chamber will be hosting its second “2nd Annual Community Event: Make It Mar Vista” on November 28th. The event is a mix of discounted events, community walks and bike rides, and other mini-street activations. 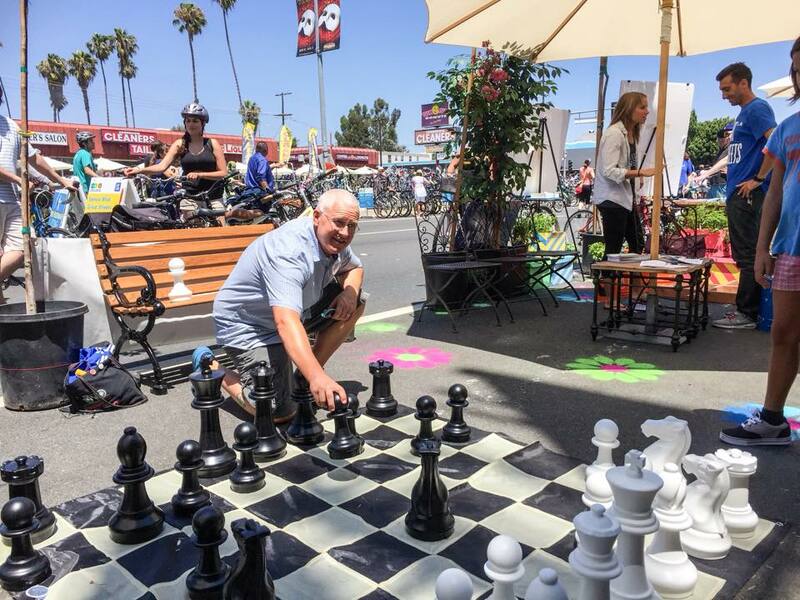 ** Thanks to receiving one of the recently-awarded Great Streets Challenge Grants, Make It Mar Vista will also be a “pop-up” event for Great Streets (a one-day street transformation). While they won’t be removing a travel lane, they will be putting in a protected bike lane. But for now, what could be the most impressive Great Streets plan is in the planning phase after receiving thousands of community comments. Will the support Bonin and his allies have cultivated be enough to overcome the inevitable backlash that a road diet along an arterial will bring? Time will tell, but perhaps the extensive outreach plan executed by Bonin and his allies will be both a bulkhead against the pushback and a beachhead to push the plan farther east and west along the boulevard. ** Full disclosure: Last year SBLA was a “media sponsor” of Make It Mar Vista. We will be again, if asked. What part of traffic nightmare don’t these guys get? Taking away a car lane on a boulevard street is not making a”great street” ! It is causing a major traffic jam 24/7. Forcing cars to go to residential side streets to try and find a way just to get back and forth to work everyday or to a doctor appointment. You’re harming the community, not helping it. Realty is people need cars to make a living!